One of the most common spots for roof leaks to appear is at the seam around a chimney. If you suspect your roof is leaking, have a professional inspect the area around your chimney to discover if that is the source of your difficulty. 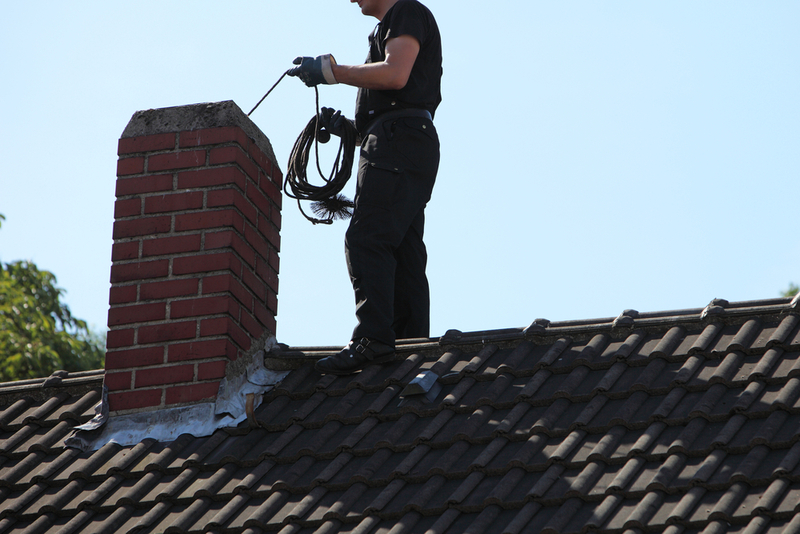 Most chimney leaks are caused by problems with the flashings surrounding the chimney. There are a few different types of chimneys. Some can be traditional brick, others may only have the circular chimney pipe coming straight out of the roof surface, and others have wood framed boxes with siding. All these chimneys have some kind of a waterproofing flashing to properly transition the shingles to the chimney. The flashing consists of two layers of sheet metal surrounding the chimney, which is installed in such a way as to keep the junction of the chimney and the roof watertight. The bottom layer, called step flashing, consists of pieces of sheet metal bent at 90 degrees, which are positioned under the shingles and up the side of the chimney. The top layer, called counter flashing, is sometimes imbedded into the mortar joints of the chimney and then doubled down over the exposed section of the step flashing. Caulk is used to close the gap in the flashing after it is installed. The caulk can eventually work its way loose, so it is wise to keep an eye on this potential weakspot in your roof. Different types of metals can be used for flashing. Galvanized painted steel are commonly used for flashing on roofs in Ontario. Copper is a more expensive option, but it tends to last longer and any gaps can be closed by soldering, eliminating the need for caulking. The cost tends to prohibit the use of copper as flashing in all but the most high-end roofing projects. If you have a chimney that is located lower down on the slope of your roof, you may have an existing cricket or saddle. A cricket is just a built-up area of roof on the uphill side of the chimney, which prevents the water from running down the roof and pummeling the uphill wall of the chimney. The cricket will be covered in shingles and or metal valleys and made to blend in with your roof so it should not be noticeable from the ground. Crickets are not necessary on all chimneys and many small crickets are even removed to install a one piece steel “backpan” which is completely waterproof. A leak around your chimney can lead to significant damage to your roof decking and to the interior of your home. Have a professional roofer inspect your chimney every year or two to make sure that everything is still in good condition. If you do notice signs of water around your fireplace, a leak near your chimney is the likely culprit. A professional will inspect the area around your chimney for signs that the caulk needs to be replaced, and for damage such as cracks and tears in the metal flashing. Leaks may also be caused by improper installation of the flashing, so make sure that all work is done by a professional and make sure you ask about warranties for any work done to your home.